Big Fold is a supplement to strategy guides and is a three sided laminated poster that can essentially have anything printed on it. 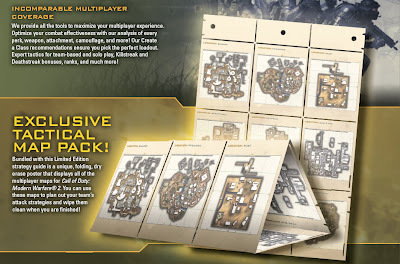 Above is a shot of their first piece, which is a tactical map pack for Modern Warfare 2, an analysis of maps, weapons, perks, attachments, and more. Admittedly, I didn't know what to think, until I saw the pic of the Big Fold, and looks like it can prove to be helpful, however, it would be nice to have it included in limited edition copies of games, as I can't bring myself to buy strategy guides.